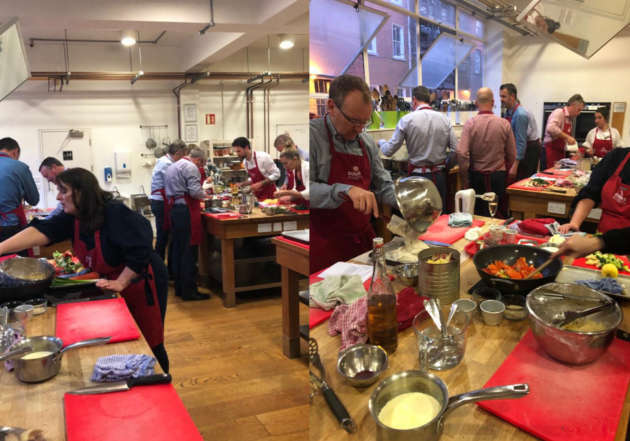 Recently the Castlethorn team along with colleagues from Chartered Land headed into the Cook’s Academy on South William Street to ‘cook up a storm’ in the kitchen and fight it out against one another to be reigned the winners of our very own ‘Chef Idol’ competition. On arrival we were greeted with Prosecco and Canapés made by the Cook’s Academy chefs to wet our pallets and get us in the mood for more food. We mingled amongst ourselves for a short time and then we divided into four teams of six and donned our aprons ready for battle! 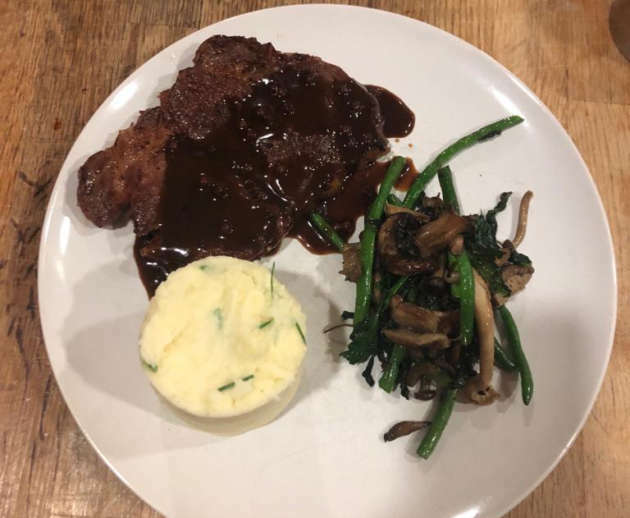 After a short demonstration on what to do we got to work creating a main dish of pan-fried rib eye steak, potato and truffle purée and wild mushrooms served with pepper sauce. We also learned how to bake a coffee cream meringue roulade for dessert. As there were two vegetarians on my team, I was lucky enough to prepare a vegetable stir fry served with yummy yellow egg noodles. Once we had hung up our white hats, we sat down to eat our own delicious creations with our team. Shortly after dessert the eagerly anticipated winners were announced. 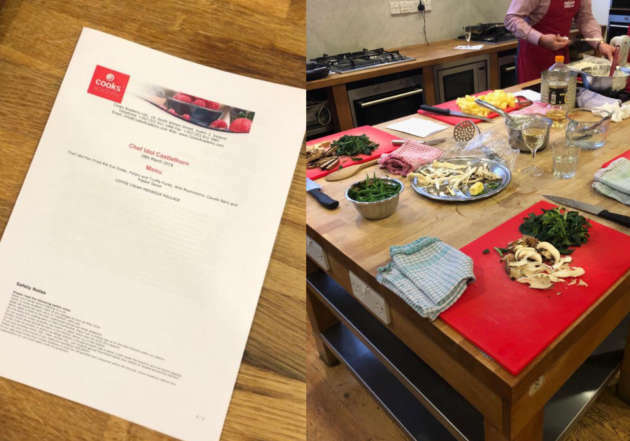 Castlethorn's very own Ben Brady and James Leonard led their team to victory and walked away with Chef Idol certificates and as the Cooks Academy so rightly put it, official bragging rights! We finished our evening with a toast to the winners and to the Cooks Academy chefs for hosting a brilliant and memorable night. Located in the heart of downtown Dublin in South William Street, Cooks Academy is Dublin's leading cookery school. 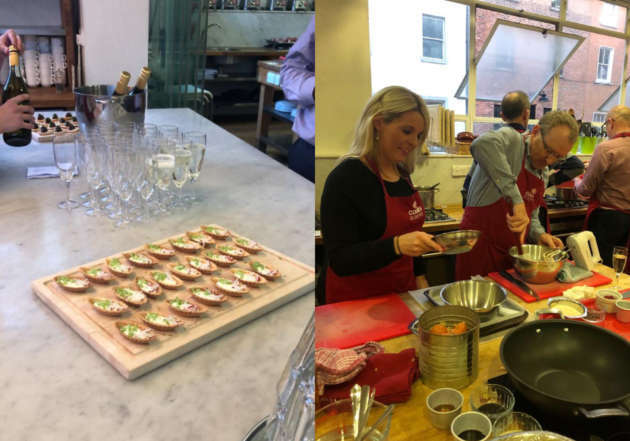 With over 4,500 sq ft (400 sqm), of floor space, Cooks Academy can comfortably cater for groups up to 100 people and hosts a variety of fun and interactive cooking events, perfect for team building with colleagues, entertaining clients, or any special social occasion.